Software vendors such as Oracle and SAP can no longer rely on their large enterprise customers for double digit year-over-year growth. In fact, their customers have not only reached a saturation point in being able to consume new solutions, but have also faced demands to cut their large maintenance bills. With nowhere to go, enterprise apps vendors now turn to the small and medium sized market to drive their growth plans. Consequently, billion to multi-billion dollar SMB stalwarts such as Infor, Microsoft, Sage, and Lawson are not standing still. In fact, they seek opportunities to take market share from the industry leaders while fending off challenges from sub $500M SMB vendors such as Agresso, CDC Software, Deltek, Epicor, Exact, IFS, NetSuite, QAD, and Syspro. Invest in last mile industry focused solutions.Customers expect their vendor to speak their language. Solutions that lack vertical fluency and limited industry customer referencability will be relegated to the ERP graveyard. Lessons learned: Demonstrate thought leadership in each vertical and lead industry discussions. Focus on a handful of verticals. Focus on rapid implementation and realization. Gone are the days of 12 to 18 month deployments. Customers seek deployments times with less than 3 months. Lessons learned: Consider SaaS and OnDemand options. Templates and productized roll-outs improve time to market but can’t compete with SaaS solutions and onDemand offerings in demonstrating value to customers. Expand the number of trusted partners and vendors. As SMB’s expand across the globe, they expect vendors to invest in trusted partners for both delivery and product footprint. Customers expect partners to assist with localization in new geographies, extend vertical solutions, and integration. Lessons learned: Build partner ecosystems to geometrically expand reach while meeting customer needs. No vendor can deliver on all customer needs. Deploy easy to use reporting tools and BI. Value out of the box requires BI and reporting tools to be proactive and pervasive. Users should have access to relevant and timely information along business processes. Lessons learned: Design reporting tools with the end in mind. Start with the value of information and embed throughout the business process. Reduce administrative complexity and ownership costs. 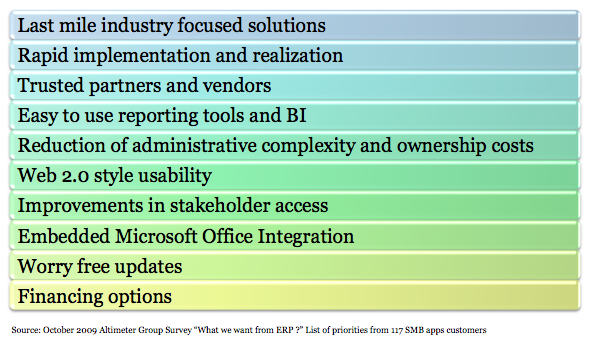 SMB’s seek enterprise class capabilities sans the resource overhead of traditional large ERP products. Business users need to be able to make changes and extend the system. Ownership costs such as maintenance should deliver value or be reduced. Lessons learned: Design self-service administration capabilities from the get-go, not an afterthought. Software maintenance needs to deliver value or be offered in tiers based on perceived value. Apply Web 2.0 style usability. Solutions should not require extensive training. New generations of work expect the simplicity and ease of use from consumer based web applications. Lessons learned: Invest in user experience and user interaction. Design process flow based on role-based personas. Improve stakeholder access. Employees, partners, and customers must gain access to key business information. Value should not be locked away from users when disconnected. Mobile remains a future growth area. Lessons learned: Allow information to be accessed by everyone, everywhere, and at anytime. New stakeholders will need access so apps should be designed with bullet-proof role based security. Embed Microsoft Office Integration. Ability to use productivity tools should be a given. Customers seek the ability to seamlessly integrate. Lessons learned. Success requires the design Office integration to be both a user interface and gateway into applications. Clunky interfaces into Microsoft fail in adoption. Deliver worry free updates. Customers should be able to update and upgrade software without significant time spent testing integrations and taking down the system. Lessons learned. Design application management into the system design. Consider the business impact of down time. Provide financing options. Customers now expect vendors to provide financing to facilitate license purchases. In many cases, clients seek financing to preserve cash position and add additional services such as training and implementation. Lessons learned. Use financing as deal enabler to drive not only license growth, but also larger deal sizes. Financing is a weapon. Prospects and customers – do these requirements ring true? Vendors -where are you with your SMB strategy? Let us know how we can assist. Please post or send on your comments to rwang0 (at) gmail (dot) com or r (at) altimetergroup (dot) com and we’ll keep your anonymity.